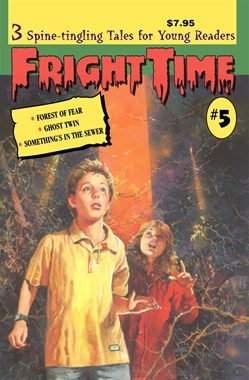 In FOREST OF FEAR, Mike and his sister see a strange light in the sky. Thinking it is a shooting star, they follow it, unaware that their planet is being visited by creatures seeking human specimens for grisly experiments. Ever since he can remember, Peter has thought about his twin brother, Charlie, who died at birth. When Charlie appears in a mirror, Peter may be forced to destroy his GHOST TWIN, the brother he always wished to know. SOMETHING'S IN THE SEWER, and it's alive! Only Sheldon has seen it, but he knows it's after his friend Tony and the reason other kids have disappeared. How can Sheldon and Tony defeat it before it destroys them?